We’re going to stray from horror this time in favor of some sword and sorcery tales by the great Fritz Leiber (1910-1992). He wrote in multiple genres including science fiction and horror (some of which were covered here: https://horrordelve.com/2014/05/17/fritz-leiber-horror-stories/), but for now we will look at a few of his Fafhrd (the Barbarian) and The Gray Mouser (a thief-mage) stories. He wrote several tales involving the two adventurers over a span of 50 years beginning in 1939. The heroes lived in a city known as Lankhmar in the world of Newhon. TSR, the company that used to produce the Advanced Dungeons and Dragons Role Playing Game, paid Leiber for the rights to adapt these creations for both their popular role playing game as well as a board game. In 2006, Mongoose Publishing began putting out Lankhmar material for use with its RuneQuest RPG. 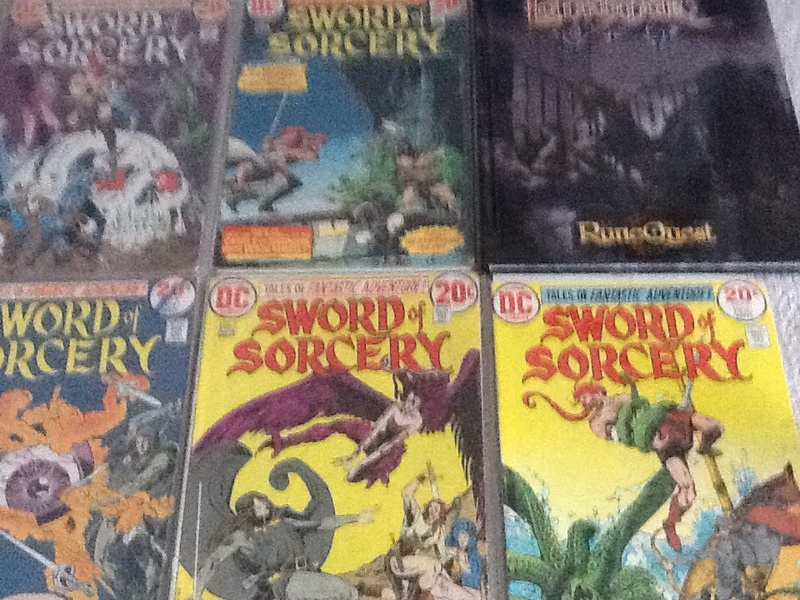 DC Comics published a series based on the two in 1973, titled SWORD OF SORCERY. Some were direct adaptations of Leiber’s stories (including “Thieves’ House” and “The Sunken Land”). Others were original plots written primarily by Denny O’Neil. EPIC Comics also adapted some of these tales in 1991. This article looks at all the stories contained in the ILL MET IN LANKHMAR collection put out by White Wolf Publishing in 1996. It combines the books SWORDS AND DEVILTRY and SWORDS AGAINST DEATH. My personal favorites here are “The Jewels in the Forest”, “Thieves House”, “The Howling Tower” and “Bazaar of the Bizarre”. 1. “THE SNOW WOMEN” (1970) – Fafhrd’s origin story. Unhappy being a singing skald in the matriarchal society of the Cold Wastes, Fafhrd escapes it and his mother with a beautiful thief with whom he’s fallen in love. 2. “THE UNHOLY GRAIL” (1962) – This is the origin story for The Gray Mouser. As a young magicians apprentice, he finds his master’s house burned and his teacher slain. Risking his soul, he delves into the dark magic he’d been warned against using for revenge. 3. “ILL MET IN LANKHMAR” (1970) – This tale recounts the events that led to Fafhrd and The Gray Mouser becoming friends and teaming up. They met by chance as both were robbing members of the Lankhmar Thieves’ Guild who had stolen some valuable jewels from a merchant. They fought well together and became instant friends. After their successful foray, they went to The Gray Mouser’s loft to meet each others’ girlfriends before leaving to buy more alcohol. They returned to find the women conversing. Soon the two girls began to chastise them for failing to slay Thieves Guild Master Krovas, who had incurred Fafhrd’s girlfriend’s wrath in the past. The tipsy duo finally set out on the task in order to stop the nagging. They infiltrated the thieves’ guild house disguised as beggars to kill Krovas. The description of the Thieves’ House interior with its training rooms, map room, and magic room are fantastic. They encounter a wizard employed by the Guild performing dark magic with a giant rat creature acting as his servant. This story won The Nebula Award for Best Novella in 1970, as well as The Hugo Award for Best Novella in 1971. 4. “THE CIRCLE CURSE” (1970) – Languishing in grief over a terrible loss, Fafhrd and The Gray Mouser leave Lankhmar vowing never to return. They spend three years traveling and partaking in different adventures before rethinking their previous vow. 5. “THE JEWELS IN THE FOREST” also called “TWO SOUGHT ADVENTURE” (1939) – The two follow directions from notes in the margin of a book on architecture that seems to taunt readers to try and obtain the author’s treasure. It lies in a tower in the forest. Its riddle states it’s guarded but there is no monster or demon or traps. Along the way, they are ambushed by a rival group seeking the same treasure but manage to repel them. When approaching the tower, each feel a strong sense of dread emanating from it but remain resolved to obtaining the fortune within. The treasure itself and its bizarre defender are fun and inventive in this tremendous tale. 6. “THIEVES’ HOUSE” (1943) – The duo help steal a bejeweled skull and skeletal hands but are double-crossed by the Thieves’ Guild member who contracted them. They follow him back to their headquarters to regain the stolen items and revenge themselves upon him. They discover their loot being taken from a room by a red haired woman. The head of the guild, their hated rival Krovas is strangled to death inside the same room. While hiding from pursuers, they overhear testimony saying the skeletal hands animated and killed the former guild master. Upon being discovered, the two flee through the guild house and become separated. Fafhrd eventually stumbles into the Thieves’ Guild tombs deep below the house. Here he is confronted by the ghosts of master thieves from long ago who task him with a mission. He must recover the lost skull with its hands and return them before the next midnight, or they will come for him. 7. “THE BLEAK SHORE” (1940) – A pale man approach’s Fafhrd and The Gray Mouser at a tavern and curses them to journey to the Bleak Shore to face inevitable doom from the creatures that lurk there. 8. “THE HOWLING TOWER” (1941) – The Gray Mouser is forced to follow Fafhrd after he he has been lured off overnight to a dreaded tower whose unearthly howling seems to have taken control of him. When he arrives, he finds Fafhrd unconscious and bandaged up despite having no visible wounds on him. An old man greets The Mouser, saying the ghosts that haunt the tower are attacking his friend on another plane of existence and offers to send him there to rescue him. The Mouser must decide if he can trust the old man while Fafhrd’s life hanging in the balance. 9. “THE SUNKEN LAND” (1942) – While at sea, Fafhrd finds a strange ring with a key attached to it in the belly of a fish he had caught. He sees it as good luck, but The Gray Mouser has a bad feeling about it and tells him he should get rid of it. He keeps it despite the warning. Soon afterward Fafhrd is swept overboard by another ship that got too close. He pulls himself aboard it and is forced to fight off several members of the crew who look like natives from his homeland. When the ship nearly capsizes, Fafhrd helps steady it and is allowed to remain. Soon the ship lands on a mysterious island called Simorgya. It’s a legendary sunken land that seems to have just resurfaced. The ship’s mad captain leads his crew ashore to plunder Simorgya’s rumored treasure hoard despite several ominous clues that the island is inhabited by strange creatures. 10. “SEVEN BLACK PRIESTS” (1953) – The two adventurers steal a diamond eye from a mountain idol, setting seven murderous priests after them while the diamond eye begins to exert an evil influence on Fafhrd. 11. “CLAWS FROM THE NIGHT” (1951) – The two friends deal with a plaque of bird attacks that have been going after women so much that many have taken to wearing cages over the heads to protect their faces. These large birds also steal a gem the pair seek to attain in this mysterious tale. 12. “THE PRICE OF PAIN-EASE” (1970) – The two companions steal a small garden-house from a local Duke and move it into the spot where Ivrian and Vlana were murdered. They begin to dream of their lost loves and each seek out a local mage to help them finally put an end to the torment they feel over the women’s deaths. Fafhrd consults with Ningauble of the Seven Eyes as The Mouser mets with Sheelba of the Eyeless Face. Each pledge their servitude to their respective hedge mages in return for relief and are given a quest to steal Death’s Mask in order to accomplish this. 13. “BAZAAR OF THE BIZARRE” (1963) – Fafhrd and The Gray Mouser are individually summoned by their patron sorcerers Ningauble of the Seven Eyes and Sheelba of the Eyeless Face to deal with the threat of a peculiar curio shop that has sprung up in The Plaza of Dark Delights. When The Gray Mouser arrives earlier than expected, he falls under the spell of the magical place which is filled with items of his greatest desires. Fafhrd is told by the two sorcerers that his friend is in mortal danger inside the shop which is not what it appears to be. They give him a spider web blindfold that enables him to see things as they truly are, as well as a cloak that turns him invisible to protect him from the shops dark powers and magical guardians. He arrives to see hideous things everywhere, and The Mouser being consumed by a hellish black wall. This is a true classic! Fafhrd and The Gray Mouser continue their adventures in several more collections of stories.